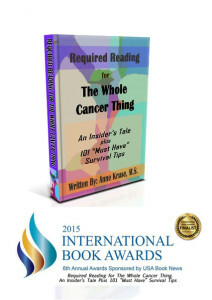 My AWARD WINNING book, REQUIRED READING FOR THE WHOLE CANCER THING. AN INSIDER’S TALE PLUS 101 “MUST HAVE” SURVIVAL TIPS has been published by Sisterhaus Publishing and is available on Amazon.com. Please CLICK HERE to BUY THE PAPERBACK OR E-BOOK. PLEASE NOTE: Kindle books are readable on ALL electronic devices. FREE SOFTWARE is available for your PC, Mac, Laptop, Tablet, or smartphone. Please CLICK HERE to get a link to the software. OR simply search “Free Kindle Software” and follow instructions. OR go to iTunes APP store on your phone and search “Kindle” and install. TO DONATE to my cause please click on the DONATE button above on the right and you will be directed to PayPal to complete your donation. If you do not have a PayPal account please contact me at annekrusewriter@gmail.com and you can arrange alternate forms of payment. Got cancer? Need a laugh and some understanding? This is the book for you. Or, are you a family member, friend, co-worker or student and you want to know what it’s like on the inside? Many people are afraid to ask the questions that this book answers. Through the author’s penchant for storytelling, this book shares wit and wisdom yet to be seen in conventional self-help cancer literature. Personal first-hand insights are shared in a real, open, and honest way. Witness the author’s vulnerabilities, disasters, and triumphs she experienced while traversing the cancer frontier. 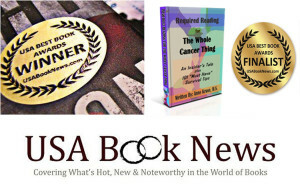 A must read for anyone interested in becoming educated in the strategies and nuances of managing life during cancer diagnosis, surgery, chemotherapy, radiation and rejuvenation. This includes: patients, doctors, nurses, medical and nursing students, counselors, counseling students, medical assistant trainees, writers and film school students. It’s a perfect impulse buy for those seeking an entertaining, relatable story that can help you or someone you love through the toughest time in life. Like a conversation with a good friend, this book fosters understanding and healing while preserving the option to vent or laugh when needed. The list of 101 “Must Have” survival tips completes the book resulting in a simple yet comprehensive go-to guide for those seeking the truth about the cancer experience.